A red-crowned crane found itself in a tiger enclosure in a Chinese wildlife park. Unfazed, it faced off against the two giant cats – and won. 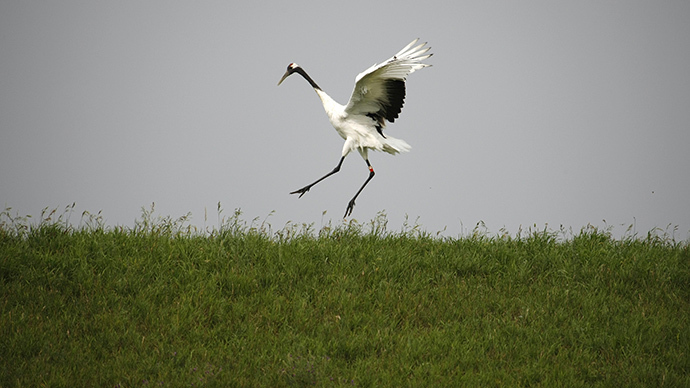 A video taken on a cell phone by a visitor at the Fuyang Wildlife Park shows exactly where the White Crane Kung Fu-style comes from. The crane got caught in a strong gust of wind and was blown straight into the tigers’ den during a display in the park in Zhejiang Province. The two predators immediately went after what they thought was an unexpected easy snack. The bird’s doom appeared sealed... but after a few seconds of running, it turned around, spread its wings, and faced the cats in a classic Kung Fu position. Within moments, it was the tigers that were on the run. The tigers repeatedly tried to team up on the brave crane – but were again sent packing. The standoff ultimately went on for minutes, according to CCTV. In the end, the wildlife park’s staff managed to get into the enclosure and rescue the bird – or perhaps the hapless tigers. “Master Crane” reportedly got off with minor injuries.